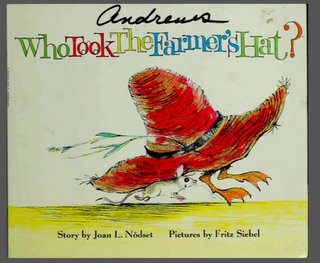 Tuesday night I started the board retreat with a reflective dialogue based on reading the children’s classic Who Took the Farmer’s Hat? I sent the book around the room, with a different board member reading each page. The reading took about five minutes. Why would a board consultant ask you to read this book? And so it went. We spent about 20 minutes discussing and applying themes to the board’s role, getting deeper into the themes as we went along. As often as I can, I try to incorporate reflective dialogue into my work with organizations, especially boards or work groups. Brain research tells us that we can’t scold, argue or out-fact our way to change in others. But we can open the door to it by helping to spark moments of insight. In my selection of materials, I’m hoping not only to spark discussion but also to open minds to new ideas, to new possibilities. As the conversation facilitator, my role is to create a safe space for participants to share their ideas, to pursue concepts that might not be fully formed or are even a bit contrarian. I also come equipped with questions to help spark reflection and move conversation forward. A good resource for questions you can use is Making Questions Work by Dorothy Strachan. I sometimes get push back from groups when I select adding a poem with discussion into their board meeting or retreat. Yet, those same groups are wondering how to develop stronger personal relationships among their board members. I’m all for physical bonding exercises at the right place and time. But I have a deep love for these reflective discussions that allow board members to enter a topic through a different frame. We tend to compartmentalize our board members based on their professions, failing to create space for them to share their many gifts and knowledge from other aspects of their lives. My clients are always pleasantly surprised that their retired banker taught philosophy in his youth, or that lawyer was a race car driver. Since a great workshop I attended given by Adam Davis, executive director of Oregon Humanities and former director of the Center For Civic Reflection, I’ve added A Bed for The Night, by Bertolt Brecht into my work with so many nonprofits. And I regularly assign Adam’s provocative essay What we don’t talk about when we don’t talk about service to my graduate students before we jump into any community projects or service learning. Sometimes I use a poem, a video or short story like the one above. TED talks can be great reflection starters or a reading from the relevant organization development literature. Other times we might reflect on a research report. Many of my colleagues have used movie clips. The Center for Civic Reflection has a list of resources on different topics that you might consider as well as questions for you to use. For example, you might want to read Maimonides From Laws Concerning Gifts to the Poor to start your next fundraising discussion. Please share your own experiences and resources that you’ve found helpful with us and with our readers. Very helpful post Gayle. Love the different resources you’ve used, including the Farmer’s Hat – wouldn’t have occurred to me to consider a children’s book! Also like the reference to Center for Civic Reflection, which is new to me. Abby, It’s surprising what can be relevant. And children’s books can be great resources.